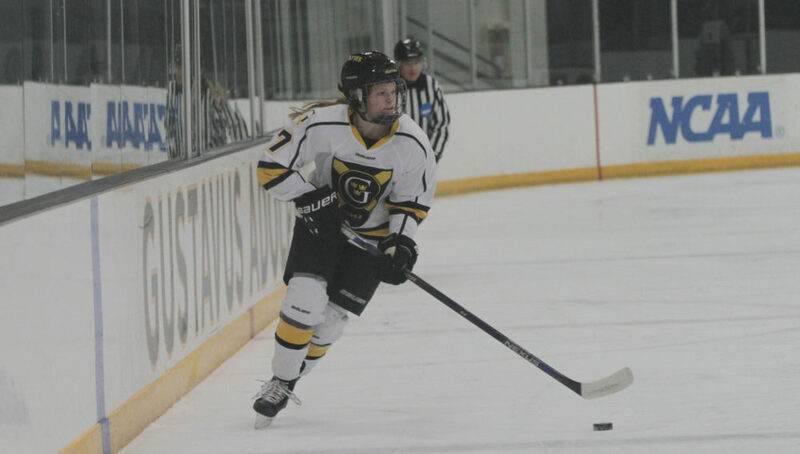 SAINT PETER, Minn. – The Gustavus women’s hockey team played host to St. Olaf on Saturday afternoon and came away victorious by a score of 4-1. All four of the Gustie goals were scored by first year players. Although the Gusties outshot the Oles by a tally of 32-6 through the first two periods, the score remained 0-0 going into the third. In the third period the Gusties took over early scoring three goals in the first 5:22. Grace Schulte (Fy., Little Falls, Minn.) and Kayla Vrieze (Fy., Eagan, Minn.) nothced goals at the 1:14 and 4:38 marks respectively to give the Gusties a 2-0 cushion. Stephanie Anderson (Fy., Blaine, Minn.) assisted on the Schulte goal, while Paulia Scheid (Jr., Stillwater, Minn.) and Madigan Goldsworthy (Fy., Chaska, Minn.) assisted on Vrieze’s power play score. Lilia Scheid (Fy., Stillwater, Minn.) then turned the game into a memorable one for herself as she not only notched her first collegiate goal at the 5:22 mark, but she also recorded her first two-goal game when she scored again at 13:02. Amelia Vosen (Jr., Nowthen, Minn.) assisted on Scheid’s first goal while Allie Stanger (Sr., Paynesville, Minn.) and Jordyn Peterson (Fy., Brookings, S.D.) assisted on her second. The Oles scored a short-handed goal at 14:39 to make the score 4-1 which held out to be the final. The Gusties outshot the Oles in the game by a total of 52-13. Amanda DiNella (Sr., Oakbrook Terrace, Ill.) got the start in net again for the Gusties, making 12 saves, while allowing the one goal. The Gusties will next be in action on Friday when they host Hamline for a 7 p.m. contest.